The CARIFORUM-EU Economic Partnership Agreement is a sui generis North-South trade and development agreement. The C-EPA is a bi-regional agreement, signed in Bridgetown, Barbados in October 2008, with the specific aim of supporting the sustainable development of the Caribbean. As a paradigm changer in the ACP-EU trade relationship, the C-EPA has unsurprisingly attracted considerable attention. The long process of ratification by twenty-seven EU Member States and fifteen Caribbean countries has begun, and implementation is advancing after an initial delay. reviewing the C-EPA’s compatibility with WTO rules. The book will be welcomed by trade policy experts, lawyers, trade negotiators, development experts, and other trade practitioners, as well as by academics in the field. Although the particular analysis is of CARIFORUM-EU relations, few will doubt that the issues addressed apply to trade relations in many other parts of the world. The Agreement’s articulation of the EPA concept by its EU and Caribbean negotiators is sure to inspire parallel regional arrangements that are evolving elsewhere. 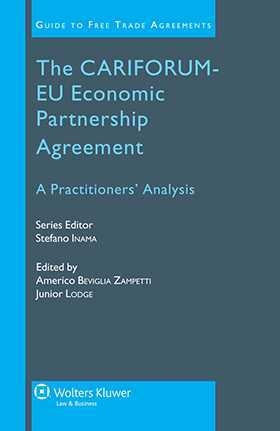 The contributors’ detailed examination of the C-EPA not only opens the way to improved understanding and sustained implementation of that Agreement but also significantly assists in the development of the global trade regime.